A beautiful contemporary Irish ring cast in sterling silver. This Trinity Knot ring features a lovely open Trinity Knot band with a clear cubic zirconia at each end. Attached to this is a larger Trinity Knot emblem on each end which crossover to give it a modern look. The Trinity Knot represents the Father, the Son and the Holy Spirit as well as eternal life and love. 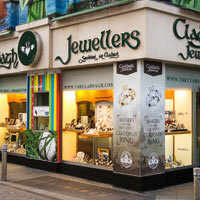 A wonderful gift for anyone who loves contemporary Irish jewellery.